We have 8 type of charter yachts in our fleet: 6 Aloa's 27, 4 Aloa 27 SC, 2 Comets 1050, 2 Oceanis 331, 1 Oceanis 381, 1 Bavaria 41 Holiday and 1 MacGregor 65. 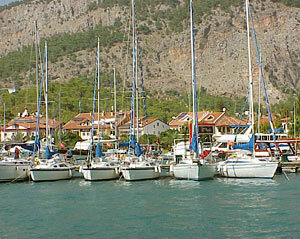 We operate our fleet from Göcek D-Marin marina. The Aloa 27 and the Comet 1050 are equipped with a tiller, which makes them easy to sail and offers more space in the cockpit area, but both of them do not have an electric anchor winch. The Aloa 27 SC is a couple of years newer version of the standard Aloa 27 and has some comfortable extra’s such as a swimming platform, larger bimini, electric fridge, electric deck shower, radio/CD player and the main sail can be hoisted from the cockpit. The three Oceanis’, the Bavaria 41, MacGregor 65 equipped with a steering wheel. The yachts all have a dinghy for transport (and/or fun!). 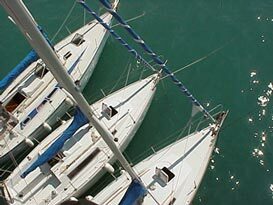 All our yachts are equipped with a VHF for contact with our base or the leadboat. Besides there is good GSM coverage along the Turkish coast and Greek Islands. You can charge your mobile phone on board with a 12 V standard lighter outlet and up to 150 watt / 240 Volt inverter. They are all provided with the standard charter equipment like GPS, deepsounder, speedometer and log, furling genoa, sun awning, bimini, basic navigation and safety equipment, cooking utensils, crockery and cutlery, bed linen, pillows and sleeping bags or anything else you basically need on your trip! Our Charter Yachts and the crew are fully insured by Allianz.